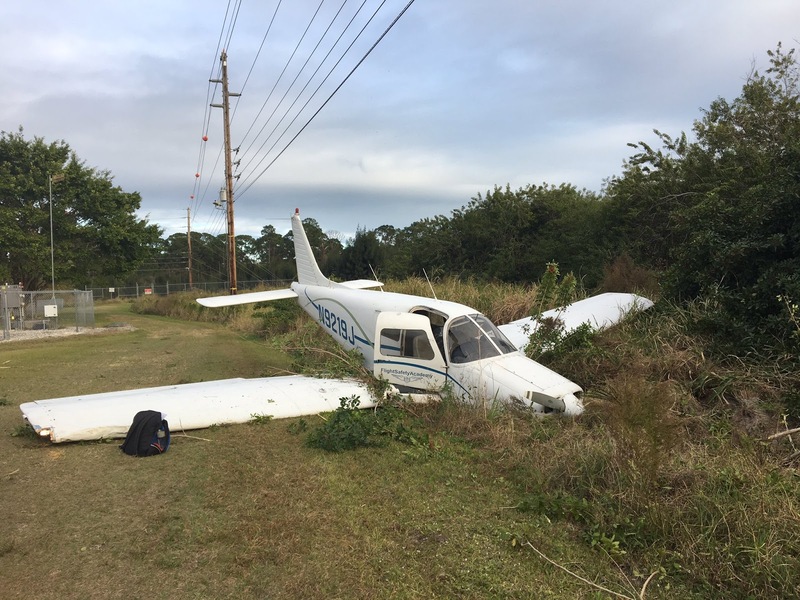 On February 8, 2019, at 1706 eastern standard time, a Piper PA-28-161, N9219J, was substantially damaged when it impacted a utility pole and trees during a forced landing near Vero Beach, Florida. The private pilot was uninjured. The airplane was registered to FlightSafety International and operated as a Title 14 Code of Federal Regulations Part 91 personal flight. 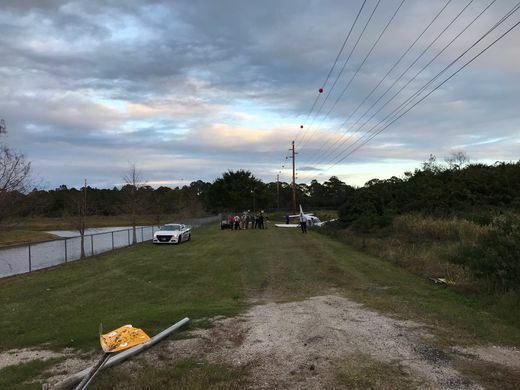 Visual meteorological conditions prevailed at the time of the accident and no flight plan was filed for local flight that originated from the Vero Beach Regional Airport (VRB), Vero Beach, Florida. According to the pilot, he was flying in the airport traffic pattern to practice touch-and-go landing maneuvers. On his third approach, the air traffic controller directed him to extend the downwind leg of the traffic pattern. On final approach, the engine power output decreased, and the pilot noted a "sinking" feeling. He stated that he did not perform any checklists but advised air traffic control that he would be making an emergency landing. He advanced the throttle lever, and the engine momentarily produced more power before losing total power about 500-600 ft above ground level (agl) while the propeller continued to windmill. 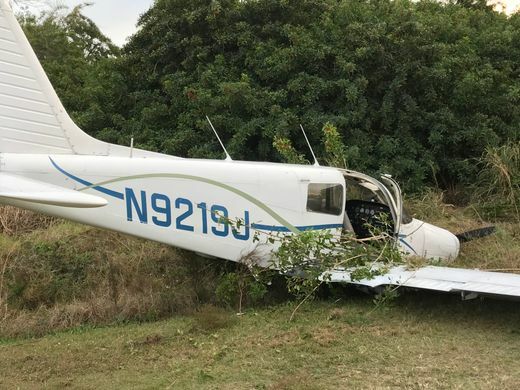 The pilot stated that he was not using Carburetor Heat at the time and that there was no time to perform remedial actions such as switching fuel tanks, applying carburetor heat, or using the emergency checklist, but that he did retract the fully-extended flaps. When he determined that he would not reach the runway, he executed a forced landing on a nearby gravel road. 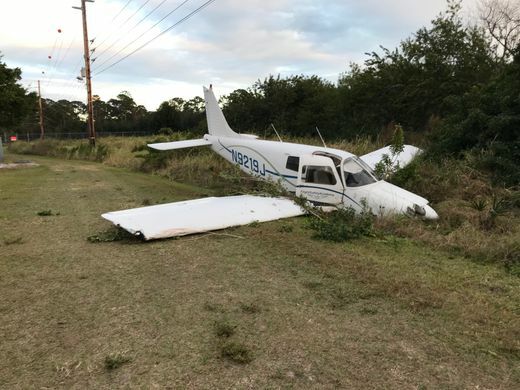 During the landing, the airplane impacted a utility pole, trees, and shrubs, coming to rest in the grass after rotating 180°. In a post-accident interview, when asked when he typically applied carburetor heat, the pilot responded that the it was appropriate to apply carburetor heat when practicing a simulated engine out procedure. When asked if there were other instances when it might be appropriate to use carburetor heat, he reiterated that it was only appropriate for simulated engine out procedures. 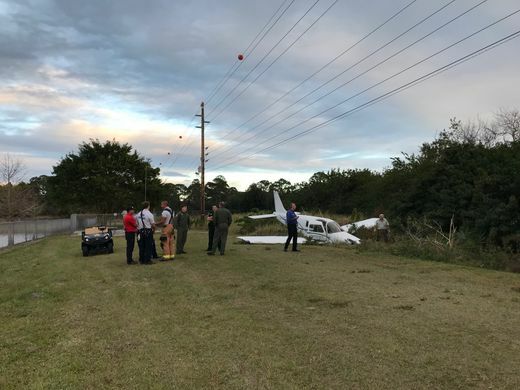 According to Federal Aviation Administration (FAA) records, the pilot held a private pilot certificate with a rating for airplane single-engine land. He was issued an FAA first-class medical certificate with no limitations on November 18, 2017. A review of the pilot's logbook revealed 128 total hours of flight experience, all of which were in the accident airplane make and model. The four-seat, single-engine, low-wing, fixed landing gear-equipped airplane was manufactured in 1988 and powered by a Lycoming O-320-D3 engine, rated to produce 160 horsepower. Its most recent Approved Airworthiness Inspection Program inspection was completed on February 7, 2019, at 14,682 aircraft hours. The engine had accrued 9,211 total hours of operation; of which, 431 hours were since the last major overhaul. The operator's records indicated the airplane had been flown 10.3 hours since the last inspection. At 1653, the reported weather at VRB included overcast clouds at 5,500 ft agl, 10 miles visibility, and wind from 050° at 9 knots. The temperature was 23° C, the dew point was 17° C, and the altimeter setting was 30.20 inches of mercury. The calculated relative humidity at this temperature and dewpoint was 71%. A High Resolution Rapid Refresh numerical model for the time of the accident was obtained from archive data at the NOAA Air Resource Laboratory over the accident site coordinates. The sounding depicted a temperature inversion due to subsidence at 6,724 ft with drying conditions immediately above the inversion. The Rawinsonde Observation algorithm indicated a high probability of carburetor icing from the surface to the inversion or through 5,000 ft. According to a Carburetor Icing-Probability Chart recommended by the Australian Transport Safety Bureau, the atmospheric conditions at the time of the accident were "conducive to moderate icing at cruise power and serious icing at descent power." FAA Advisory Circular 20-113 explains, "To prevent accidents due to induction system icing, the pilot should regularly use [carburetor] heat under conditions known to be conducive to atmospheric icing and be alert at all times for indications of icing in the fuel system." The left-wing leading edge showed inward crushing. The left flap was impact damaged in an upward direction. The left outer 18-inches of the stabilator was bent upward about 15°. The right wingtip was crushed and the right-wing leading edge, inboard of the right fuel tank, was fractured back to the main spar as a result of utility pole impact. The landing gear was fractured off and one propeller blade was bent aft. The propellers exhibited no rotational scoring. The external engine exam revealed no impact damage. The spark plugs were removed and visually examined with no anomalies noted. Rotation of the engine's crankshaft produced compression on all four cylinders. Valvetrain movement was observed when the crankshaft was rotated, and the impulse couplings could be heard from the magnetos. Examination of the cylinders with a lighted borescope revealed no damage to the cylinder walls or pistons. Fuel was present throughout the fuel system, carburetor, and fuel filter. The fuel was blue, clear, and consistent with 100-low-lead aviation fuel. Mechanics employed by the operator installed a loaner propeller on the engine in order to perform an engine test run under the supervision of an NTSB investigator. The engine started after the first rotation of the propeller and no anomalies were noted in the engine operation. The magnetos, primer, and carburetor heat were tested, and no anomalies were noted. The test run was accomplished utilizing fuel plumbed from the left fuel tank. Air was blown through the fuel lines from the right fuel tank indicating that no obstructions were present in those lines. In addition, the gascolator fuel screen was removed, examined and found to be clean and free of debris. According to the normal procedures section of the airplane's Pilot's Operating Handbook (POH), the fourth step that should be performed as part of the normal descent is: Carburetor Heat . . . . . . ON if required. Review of the POH amplified emergency procedures for engine roughness revealed, "Engine roughness is usually due to carburetor icing which is indicated by a drop in RPM and may be accompanied by a slight loss of airspeed or altitude. If too much ice is allowed to accumulate, restoration of full power may not be possible; therefore, prompt action is required. Turn carburetor heat on. RPM will decrease slightly and roughness will increase. Wait for a decrease in engine roughness or an increased in RPM, indicating ice removal. If there is no change in approximately one minutes, return the carburetor heat to OFF." Carburetor Heat . . . . . . . ON.